Watermelon is a fruit that comes from the Kalahari desert in Africa. Fruits are round and red flesh which is one characteristic of the watermelon itself. 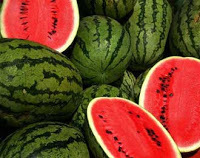 Small brown seeds with fresh water contained in watermelon is perfect to eliminate hunger during long day. However, besides watermelon apparently also has many health benefits for our bodies. Health benefits of watermelon is one of them is to prevent high blood pressure and prevent stroke. For that, the consumption of watermelon is also indispensable body. • Can accompany your diet program because watermelon is one of the fruits that contain no fat and also has a limited combination of sugar and water content a lot. • Very useful for people with hypertension because it has water and potassium content is high enough to neutralize the blood pressure in your body. • Able to encourage the heart. • It can help your body stay healthy as they contain antioxidants (beta-carotene and vitamin C). • Can stimulate more rapid discharge of urine. • Can prevent thrush quickly. The above are some of the benefits of fruit semangkan for our body health. For those of you who have multiple health problems as above, it would be nice if you start now eating a watermelon is to minimize your disease. • Can reduce the nausea that is often experienced by women who are pregnant. • Functions for enhancing fluid in the body, because watermelon is rich in water content. • Preventing muscle cramps. This often occurs in the first trimester of pregnancy. • Reduce the heat to a pregnant mother's stomach. • Can help brain development, eyesight and immune system in infants. Well, you certainly already know the importance and benefits of this watermelon. For the consumption of watermelon is also necessary to maintain the health of our bodies.